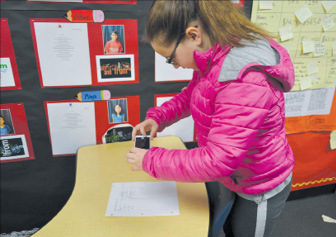 Bullis Charter School fifth-grader Anna Morokutti takes a photo of a document to upload to her FreshGrade account. Parents are not always in the classroom to see their children nail an oral presentation or smile in accomplishment after receiving a high mark on an assignment. Thanks to a new digital tool implemented at Bullis Charter School, that experience gap is closing for parents. Before winter break, Bullis Charter School introduced FreshGrade, a high-tech tool that enables students to document and upload their work and achievements to an online portfolio viewable by teachers and parents. The ePortfolios serve as a window into the classroom and help create an open dialogue so that everyone knows how students’ work is developing. FreshGrade supports Bullis Charter School in tracking a student’s progress and measuring the elements of learning not normally accessible to those outside the classroom, especially parents, allowing focus on advancement and not just the final outcome. FreshGrade tracks each student’s Focused Learning Goals (FLGs). Each year students set FLGs based on their unique needs, with goals ranging from academic achievements to developing social and organizational skills. Fifth-grade teacher Jessica Morgan said she uses the system to document students’ progress on their FLGs and provide feedback. According to Morgan, FreshGrade doesn’t replace any of the school’s other grading systems, but rather serves as a complement and provides a digital timeline of progress. Once a week in Morgan’s class students select some of their work, usually connected to their goals, to upload to their digital accounts. Parents can then view the work and initiate a dialogue among student, parent and teacher. Instead of receiving the usual shrug when parents ask how a student’s day went or what they accomplished, parents now can view a visual database of accomplishments and progress toward specific goals. And students get to tailor what they upload to the account, encouraging them to be active participants in meeting their goals. Parker said he likes that the teachers frequently update the portfolios and that the system facilitates students’ accomplishing their goals. He added that the system is “intuitive and purpose-built for the audience.” While the primary interface for the program is via Web browser, users can also access the accounts through phones and tablets. For more information, visit FreshGrade.com.